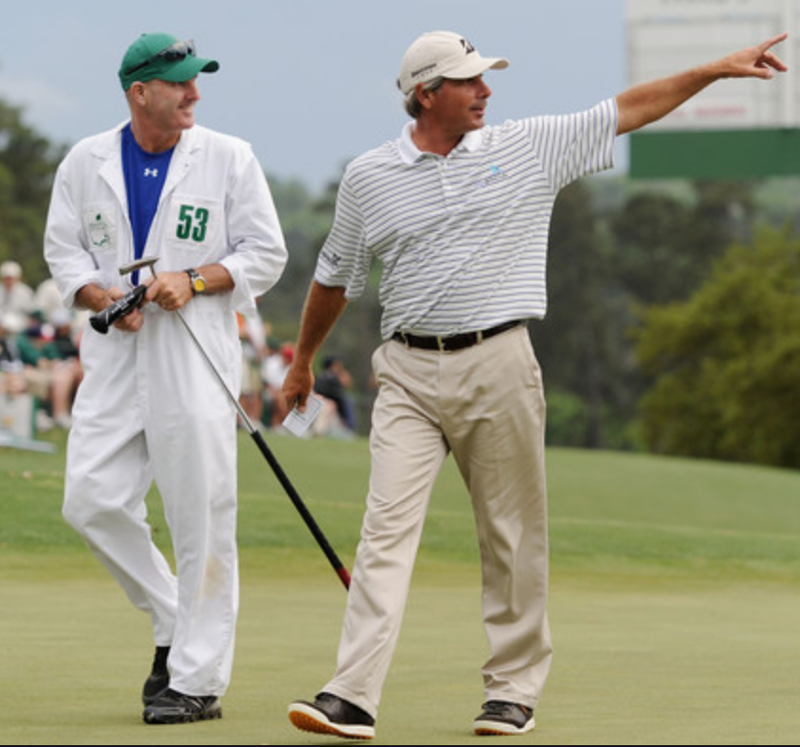 At the 2010 Masters Fred Couples sported golf shoes that looked alarmingly like sneakers and the world took notice. They alleviated his long-term back pain, he claimed. They looked so stylish, said everyone. And thus, spikeless golf shoes came walking into our lives. Shopping for golf shoes? Here’s the lowdown on cleated vs. spikeless shoes. Today’s soft spikes are designed to grab the turf and not let go. Through your weight shift, in the wet, on a slope – when the going gets tough cleats offer stability and confidence. Spikes can be changed – like new! Research and FitBits everywhere say that the average golfer walks 6-8 miles during a round. You’ll do your feet a favor by selecting a light, comfy shoe – and that’s often a spikeless style. Ditto if the day is dry, and the course is relatively flat. And the ease and convenience of wearing just one pair of shoes from home to course to clubhouse to home again – well, that’s big. Much less traction in wet conditions. Hello, Slip and slide. Rain or shine, ride or walk, a quick 9-and-dine or a competitive tournament – golf world is different every day. And the ideal footwear might be different every day too. So cleated vs. spikeless, can we just say, “l’ll take one of each”? Author Sandell BennettPosted on April 4, 2018 Categories Golf EquipmentLeave a comment on Golf Shoes – Cleated or Spikeless? “Just a chip and a putt” – it sounds so easy. But in a blink of an eye, it’s a chip and a putt and another putt. Or a chip and a chip and a putt and a putt and oh, another putt. You see where I’m headed – the downward slope to a hellish score. All because of a simple shot, done poorly. My friend chips with great technique and consistent results. I want what she’s having. And so, a goal – become a better chipper this summer. The stroke itself is so simple – see Sandy’s video here. With those visuals and a 6-step plan, I’m off to pursue a ship shape chip shot. I think there are at least 4 strokes waiting to leave my life. Know the basic mechanics cold. Take a lesson, watch a video, do it again. Practice. Boring? Bring it home. Chip to a laundry basket in the backyard. Grab a friend and play closest to the basket. Wine can help. Track chips. Mark hole with a check when a chip shot lands on green in satisfactory distance/placement to the pin, and with an X when it’s a miss. Compare shots over several rounds to get an idea of how chipping affects score – and to see improvement over time. Get to course early and groove your chip shot. Feel the pre-shot swoosh. In the rough, run the club head through the grass several times to get the feel of it before setting up for the shot. Putt! Golf isn’t a game of givens; creativity is often rewarded. On the fairway just short of the green? Don’t automatically reach for the lob wedge. Is a putt a better percentage shot than a chip? Sometimes, yes. “A chip and a putt” – that’s what I’m going for. Golf lessons, friends’ advice, magazine how-to’s, golf on TV, our own experiments, and practice, practice, practice, practice – these are the good, bad and sometimes successful ways we get better at golf. And then it’s crunch time. When we stand over a ball, the incoming, ongoing tumble of thoughts can be, well … confusing. Shoulder, grip, ball position, that darn right foot, whoops, what was that about the wrist, hello, we’ve started our downswing and who said what about the clubface, here we go. Heck. It helps to write the good things down. Golfers keep notebooks for many reasons – to set goals, keep stats, list practice ideas, track progress, chronicle an amazing afternoon or one awesome shot. 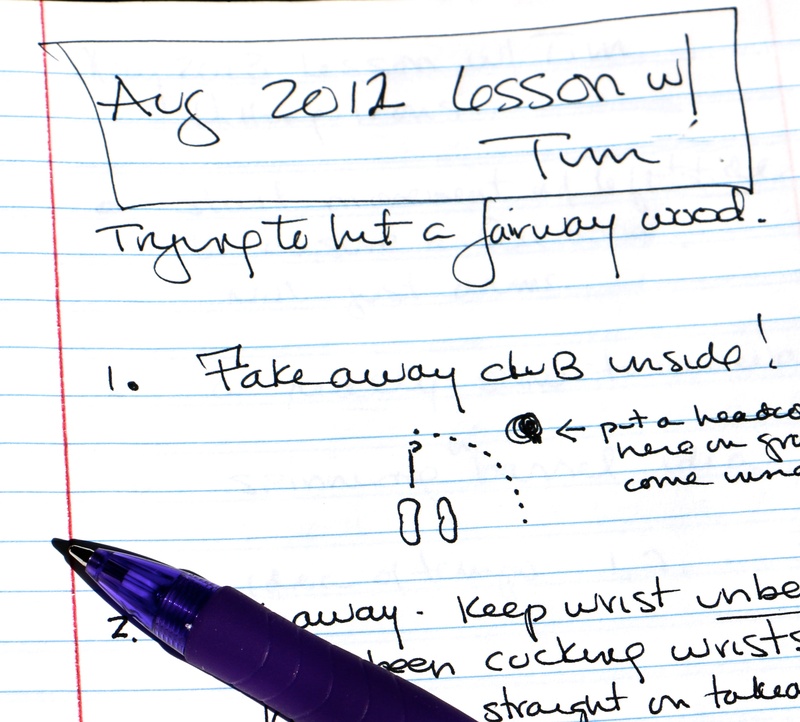 There are many good and personal ideas for keeping a golf journal. Read Sandy Wagner’s suggestions. Five years ago I took a lesson on the bane of my golf existence – the fairway wood. After a half hour, eureka, I’d learned my 3 keys to hitting it. I wrote them down. Every April after a long Michigan winter I reread them in my notebook. And then it’s crunch time – I’m standing in the fairway over the ball. I mentally check those 3 points, that’s all that’s in my head. And then I hit with confidence, clarity and (some) success. And when it’s good I send a mental fist bump to the guy who taught me and told me to write it down. Love, love the golf cart – that mini-car of camaraderie and competition. The cross-course quickness, the searching and circling for lost balls, the charging up ahead to see what’s what – love it all! The wind in our hair! Stowed snacks! Scorecard and pencil at the ready. Walking the course brings another rhapsody – about building fitness and health, and being one with the golf course. No doubt about it, 18 holes (6 miles, estimated) is a long walk. But take heart, there are ways to bring fitness and the close-to-the-course feel to any round, even when carts are required. Walk the front 9, ride the back 9. Take turns walking. Let your cart partner drive to the next hole or ball while you hoof it. Then switch places. Many of my super-smart golfer friends do this – love it. Keep it light. If you’re walking, use a pushcart. Only bring the clubs and balls you need. Love your feet. Be sure you have comfy, light supportive shoes. Water! Bring it, drink it. Staying hydrated is smart. Even 30 minutes a day of walking can help lower cholesterol and blood pressure, increase energy and stamina, reach weight-loss goals and improve bone strength according to the American Council on Exercise. Find opportunities to incorporate fitness into your round – it’s a winning golf strategy! Ever watch an outstanding golfer taking care of business around the course? It’s a thing of beauty and inspiration – and we’re not talking about awesome swings and low scores. As we head into the heart and heat of the summer season, let’s hear it for the players who treat the course with care. It’s not easy being green … a golf course takes a tremendous beating. A properly repaired ball mark takes only a day to mend – it’ll be a 3-week scar if we don’t do it right. Those lifeless sods of turf on the fairway are sad testament to players who didn’t take 15 seconds to replace and repair divots. Bunkers – there IS a proper way to rake them. 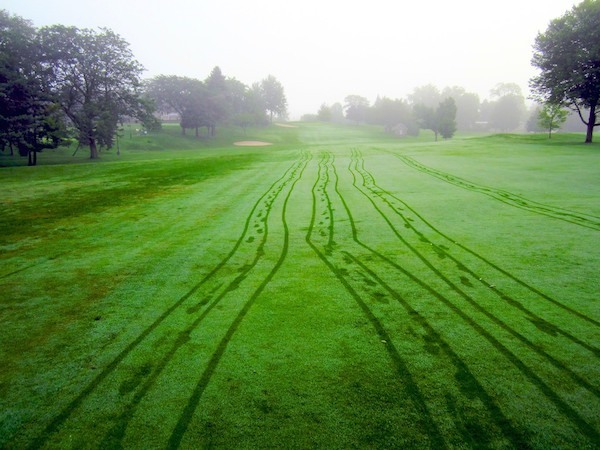 And cart damage – don’t get us started down that path! Golf’s a game of R-E-S-P-E-C-T – for traditions and honor, for partners and competitors, for the meaningful moments and indescribable pleasures the game gives us. Let’s give back by taking care of business around the course. Leave it better than we found it, smooth the way for all who follow us, and gladden the hearts of grounds superintendents everywhere. 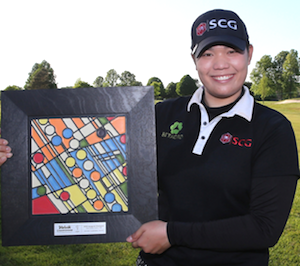 Congratulations to Volvik winner, Ariya Jutanugarn, who posted a third consecutive LPGA Tour win. Our games will never, ever reach the heady heights of the women who played in our local LPGA event, but take heart. There’s info and insights from the week we can apply to our own games, however humble they may be. Be flexible – Make a game plan to fit the situation. Jutanugarn is one of the longest hitters on the tour, but Travis Pointe held too many risks for her usual game. “It’s really hard for me because I can’t hit my driver and I really have to have a good game plan,” she said. Learn to play with pressure. Known for her final round meltdowns and 10 missed cuts last year, Jutanugarn has worked on her mental game. ”I didn’t know how to control when I got very nervous,” she said. Rather than simply relying on her pre-shot routine, Jutanugarn’s coaches have taught her to focus on slower tempos and less tension in the shoulders. Find a go-to shot that feels comfortable. Jutanugarn birdied 4 of the last 6 holes! Do you follow up a lousy golf shot with a string of excuses, remarks, angry antics, frustrated curses? Maybe an embarrassed laugh or turning away from the sight of that sad trajectory is your personal MO. Call me guilty. A post-shot routine is a way to maintain focus, reduce tension, and keep positive as we move to the next shot. It builds consistency throughout our round. This season I’ve committed to working on my own end-of-shot routine, and here’s what I’ve discovered and humbly share. A post-shot routine is a consistent procedure – a sequence of thoughts and movements – that a golfer performs after hitting a shot. Watch the pros, and you’ll see it again and again. It is personal to each golfer. Build your own sequence – and then repeat it shot to shot. Watch it, and take a moment to feel fully disappointed, annoyed, etc. Take a deep breath and release those thoughts. Release the tension. Gently tap your club on your shoe, the ground. Or create your own tension-release move. Take a mental mulligan. Visualize the shot with a good result (enjoy!) and make a note of what you will do differently next time. Move on, that poor shot is history. Snap all attention to the present and get on with it. Try the 10-step rule – be DONE with that shot after walking 10 steps away. Good shots are way more fun than bad ones. Congratulate yourself and enjoy the feeling. Maybe add a specific action – a little fist pump – to fasten the feeling and take ownership. Mentally replay the shot – swing, contact, trajectory, etc. Make a mental note of what went right. Give yourself a cue to end the mental play – “Good shot,” or a nod of the head. The whole point of a post-shot routine is managing the mental – out with the bad, in with the awesome. That’s a golf attitude we all seek! A League for Every Taste and Talent – There are leagues for learners and leagues for old hands, leagues geared for working folks, leagues that travel to the most challenging courses in the area, leagues that offer tournaments, morning leagues, evening leagues – you name it, you can find it. Play More, Play Focused – Leagues put a golf date on our calendar so every week we’ve got at least one game. Plus, the structured format of league play makes us focus – you can’t get that exact, zoomed-in level of attention at a driving range. Friends Indeed – League play opens up a world of new playing partners – and friends. You’re sure to find folks whose golf game attitudes match your own. And don’t forget about old friends – leagues can foster the bonds of those connections too. Pay As You Go – Cost is typically based on how many events you choose to play. Our tee shot takes off with a soul-pleasing whack – but then, woe, at 100 yards it takes a hard right, sucking the distance right out of the drive. It bounces even further right when it lands. Welcome to Slice-land. With knowledge comes understanding … and maybe a straighter drive. Here are 5 simple things to know about ball flight and the slice. In an amateur’s perfect world, a ball is hit square on the club ace, sailing straight and long. It flies through the air with BACKSPIN..
Once upon a time golf balls were smooth… until players noticed that battered balls traveled farther. Dimples are born – they create little pockets of suction that grab the air as the ball spins. “Grab the air” doesn’t sound good, but it is! As the ball spins BACKWARDS in flight, dimples grab air molecules on the top of the ball, propelling them backwards and speeding them up. Meanwhile on the underside, air molecules are slowed down. Now in physics we trust… low pressure is created on top in comparison to underneath and we get LIFT! So how about slice? 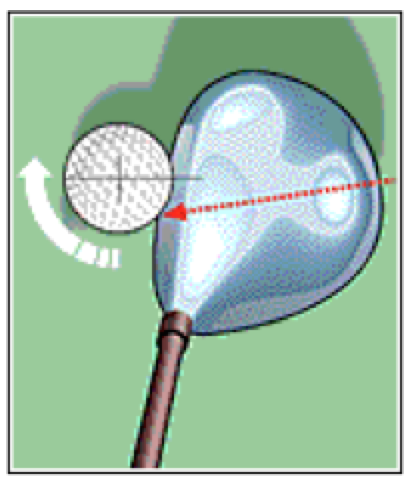 When a clubface does not meet the ball “square” (see picture at right) ,the ball starts spinning sideways. All the physics – ball rotation, dimples, air pressure – work to create “lift”, but it’s SIDEWAYS. Picture this. Throw a tennis ball with horizontal spin. See how our arm moves from the outside to the inside. That’s exactly our club’s path when we slice. Fix that and things will be straight, long and true in our golf world. Compelling stories and take-away truths – watching the women play has never been so fun. American players are at full-throttle. Winner Michelle Wie didn’t have a 3-putt over 72 holes! Bad shots happen. Smile and move on. Last day,16th hole – an unplayable lie and a clump of grass gave Wie a double bogey and whittled her lead to 1. She “moved on” to a 20 foot birdie putt on 17. Juli Inkster, 54, playing her 35th Open, carded a four-under-par 66 on Saturday, and finished tied 15th. Lucy Li, qualifying for this national event at age 11, ate ice cream during her interviews. After Wie’s final putt dropped Sunday, 4 players raced to the green with joyful congratulations. Following the Open, top-ranked Stacy Lewis won the NW Arkansas, as Wie faded and couldn’t keep her lead.